The GDPR is the most comprehensive data protection regulation to date, radically changing the way how businesses should manage personal data. This webinar is a joint presentation by data protection lawyer Paolo Balboni, Prof, Founding Partner of ICT Legal, and cryptography expert Istvan Lam, Co-founder and CEO of Tresorit. The General Data Protection Regulation (GDPR) is a comprehensive data protection regulation. The GDPR obliges you to minimize the personal data you store and handle. Access control, encryption, and client-side key management help you maintain full ownership of who is seeing what in your organization. 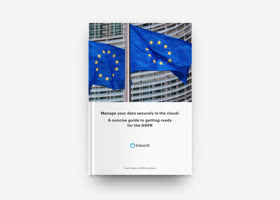 Use our resources to learn more about GDPR and about the role encryption can play in reaching GDPR compliance.